Alas, no expected babies among my friends (or, perhaps more accurately, among children of my friends). 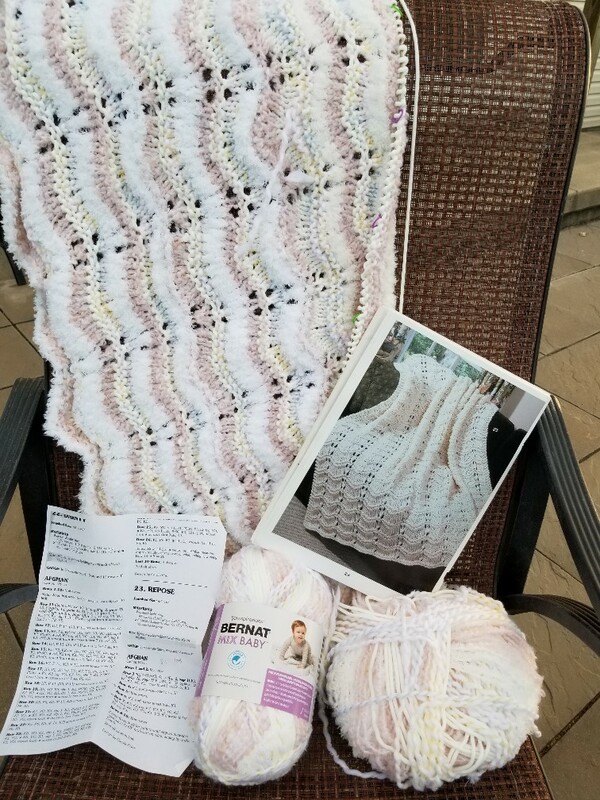 However, on a recent trip to Michaels for an unrelated reason, I took a pass through the yarn section (a “must-see” diversion from my path) and found this fun Bernat Mix Baby, in color White. Two cool things about this yarn: First – it’s a multi-fiber, meaning that it switches from several different types of fiber along a color palette. This makes for a very interesting variegated piece. Second – it is a “Big ball” variety – meaning it is a 1/2 pound of bulky weight yarn, which works up into a very nice baby blanket, and you don’t have to purchase dozens of yarn balls to make a respectably sized blanket. As a bonus, the yarn is manufactured especially for babies and carries OEKO-TEX Standard 100 certification for substances that might be found in normal dyes and fibers but might be harmful to babies or people with sensitivities. The pattern is Repose from the Leisure Arts Book, Big Book of Quick Knit Afghans. While, normally, this afghan would be knit with two strands of yarn held together, because this is a baby afghan, and because of the novelty yarn, I am adjusting the needle size, accordingly, and knitting with one strand. 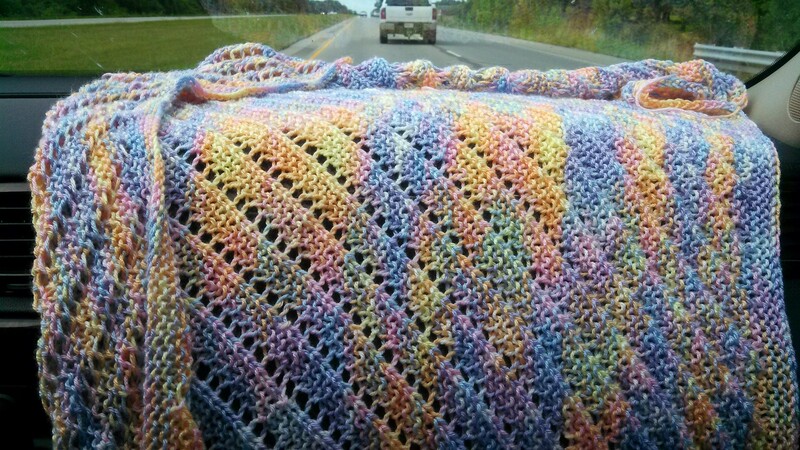 It is working beautifully, and the afghan pattern complements the change in yarn. I try to pass by novelty yarns, because I tend to be drawn to them (a sucker for the marketing, am I), but this is a terrific product and I am enjoying this project. Back at the afghans, again. There’s a new baby in the family among the cousins, and both the yarn and pattern are terrific for a baby afghan. I’ve knit this afghan several times, and used this specific yarn and color – it looks great, feels soft, and is easy to knit. 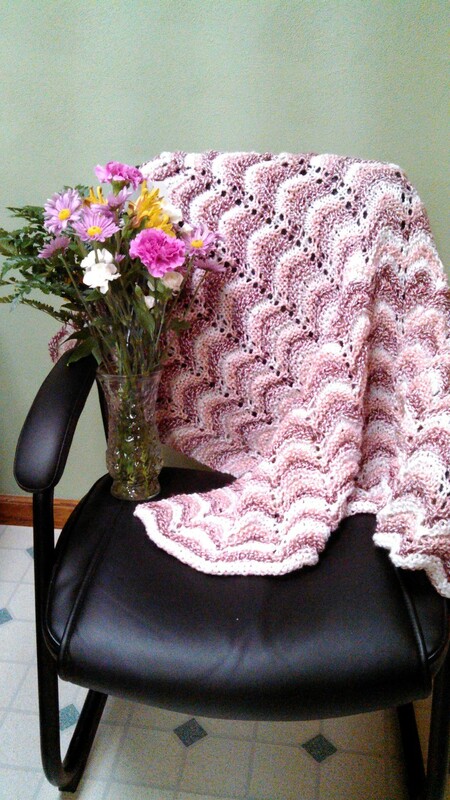 Pattern: Fanciful Rose, from Leisure Arts, “Our Best Baby Afghans” book. The book contains a number of lovely afghan patterns for baby, and is well worth the investment. Yarn: JoAnn’s Rainbow Classic, in color Blue Rainbow. Unfortunately, the yarn is discontinued. I purchased several afghans’ worth several years ago, and after this afghan (which uses two skeins), I have two skeins left, in color Rose. Adjustments: I made the afghan narrower than called for in the pattern by two repeats. An adjustment to accommodate the yarn more than an issue with the pattern. Minor Annoyances: This yarn reminds me of annoyances I have with self-striping yarns — frequently, there is a “break” in the yarn which throws the pattern off. In order to keep the pattern consistent, a quantity of yarn is wasted. I recognize that this is what happens when you purchase mass-manufactured yarn, and that it’s simply part of the manufacturing process, but it is still annoying. Yes, there was a break in this skein. On the road home from taking Son to college. Last baby afghan! Tranquility, pattern from Leisure Arts. Caron Simply Soft yarn – very nice, very soft, and beautiful colors – Baby Bright Ombre. Completed the latest in the baby afghan sagas. Love the pattern – Fanciful Rose, from the Leisure Arts #3219 “Our Best Knit Baby Afghans” – love the yarn – Rainbow Classics from JoAnn’s – not crazy about the shade – Berry/White- for a baby afghan. The critics in the house say it’s fine, but it just doesn’t appeal to me. Too bad, because I have one more afghan to knit in this. At least it goes fairly quickly, and it’s a great travel project because you can easily see where you are in the pattern, and the pattern is easy to memorize. The flowers are from two of kids (the ones that are still in HS and have to live with me). They knew I was extremely stressed during tax season, so they brought me flowers. They have trouble loading the dishwasher and picking up their clothes, but then they go and do something like this. Sniff. The current baby afghan in progress — Sunny Cables and Crowns from the book, Our Best Knit Baby Afghans by Leisure Arts. The afghan pattern contains the usual requirements for my interest – Interesting Pattern, Texture, and Easy-to-Memorize pattern. I think I’m about half-way done. Yarn is Pound of Love by LionBrand, in Denim. Just so you know, I’m not really into baby afghans, but I want to give a nice baby gift to all these ladies in my life, so here we are. Will be glad when I can get away from afghans for a while. For someone who has no infants in her life, I seem to be making a lot of baby afghans. 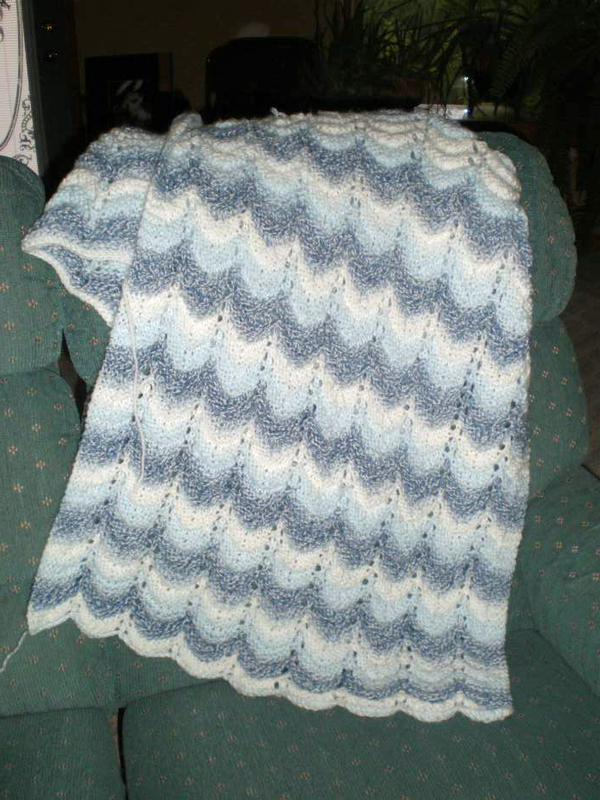 Blue Baby Afghan is finished, and I liked it so well that I will be making another. A quick check last week — one done and THREE more to go! All the ladies are due in December and January, so I need to get hustling! When I started on the Teal Afghan, I thought I would simply have a few made up ahead. That doesn’t seem to be working out. I really like this one – the pattern is extremely easy (Fanciful Rose from Leisure Arts) and goes very well with the self-striping yarn. 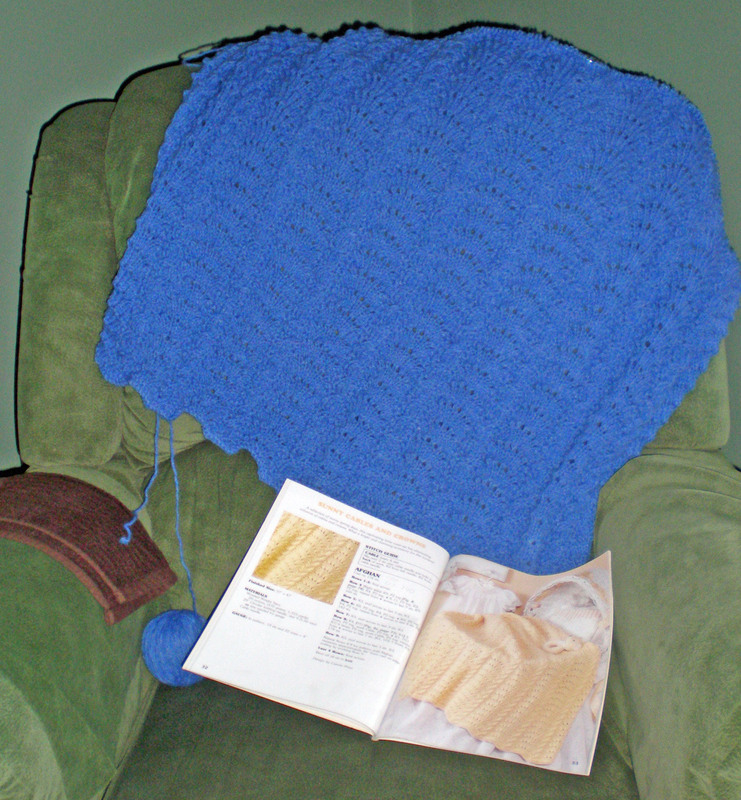 I ordered two more afghans’ worth of yarn (Rainbow Classic, from JoAnn’s) – one in this lovely blue, and one in green.